Because there are many versions of Windows and because Windows can be managed in many ways, the autorun or autoplay feature can be turned off in many different ways as well. We talk more about these methods at the Turn off and disable CD-ROM autorun and autoplay page. There is one other way of disabling the autorun / autoplay feature which is more global relative to your computer. You can configure your Windows to disable the autoplay feature for all of your system's drives. This can be done using so called group policy for your computer. Group policy is a feature in modern Windows that provides centralized management and configuration of computers and remote users in an Active Directory environment. You can find more details about group policies at the Group policy page. This way of disabling the autoplay capability is often used for security reasons on shared computers. Go to your Start menu and click Run. You can get to here also by pressing the Windows and R buttons simultaneously. Type GPEDIT.MSC and hit ENTER. This brings up so called Group Policy Editor. Scroll down in the right pane until you find the Turn off Autoplay item. Double-click the Turn off Autoplay. When you are in the Turn off Autoplay Properties dialog box, click Enabled. And finally choose All drives from the drop-down list underneath. Find the Turn off Autoplay policy and double-click it, or you can also right-click it and select Properties. Click Enabled and then OK. Then, double-click the Default behavior for AutoRun. Click Enabled, and choose Do not execute any autorun commands in the resulting drop-down list. You may need to log off for the change in the Autoplay group policy to take effect. 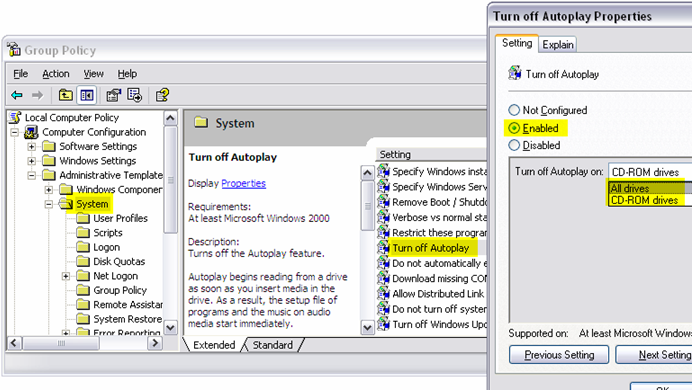 The print screen below shows how autoplay / autorun can be disable via a group policy in Windows XP. Disable autoplay does not work! In case you have any troubles setting this up, you can ask someone in our IT discussion forum. Do you have more tips besides the disable autorun policy? The Task Manager has been disabled by your administrator article might be handy too. When opening a CD in your media player, you might run into the Windows Media Player cannot play DVD message. Some of the resources below might be useful too.